Early Childhood Education: Is “Play-Based Learning” Imperiled – or Alive and Secure? The two academics demonstrate a sound grasp of the “culture war” enveloping campus culture and correctly point out that “safetyism” poses a real threat to academic freedom on North American campuses. As a child of the radical sixties, I was there when students fought to make the universities more open to new ideas, controversial speakers, and more democratic practices. Racism, bigotry and intolerance should be resisted and rejected. Having said that, it’s disconcerting to see today’s university students so quick to take offense and so inclined to silence those espousing different viewpoints. While Lukianoff and Haidt correctly dissect the problem, they miss the mark in diagnosing the state of early childhood learning. 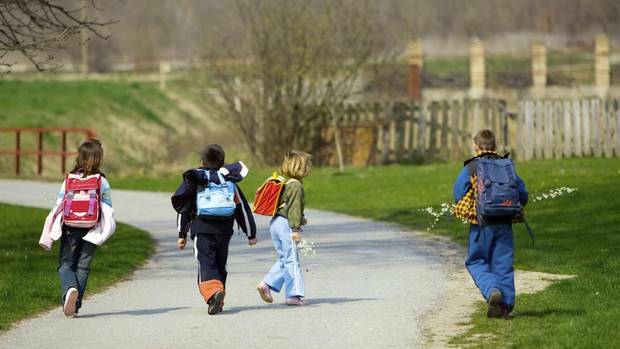 The “decline of play” is plainly observable in today’s schoolyards and playgrounds. Overly protective parents, known as “helicopter parents,” are easy to spot in affluent and upper middle class school communities — and gravitate to independent schools. It is simply wrong, in my estimation, to assume that “play learning” is endangered in pre-school, kindergarten, or early years education. Unstructured free play is good for little children and it does help to prepare them for the real, ‘rough-and-tumble’ world. Where Christakis, Lukianoff and Haidt all go wrong is in setting up ‘free play’ in opposition to any form of early learning incorporating explicit teaching of core knowledge and skills. Claiming that it is harmful flies in the face of a great deal of recent education research informed by cognitive science. Australian teacher-researcher Greg Ashman has effectively demolished the two essential claims about early learning made in The Coddling of the American Mind. Free play may well be essential in learning social skills, but that does not mean it suffices for academic learning. Renowned Canadian education critic, Andrew Nikiforuk, once put it this way: “If learning is so natural, why do we go to school? '” The implicit answer: to learn something. Pyschologist David C. Geary makes the helpful distinction between two types of learning, biological primary and biological secondary forms. Play is probably the best way to learn social skills, such as learning to work together, but not for learning academic abilities and skills. The weight of research evidence, drawn from cognitive science, suggests that most children require more explicit instruction because learning requires some prodding, practice, and persistence. Some students, particularly those with learning difficulties or socio-economic disadvantages, simply do not grasp the key ideas or master the fundamental skills without a measure of teacher-guidance. Lukianoff and Haidt, citing Christakis, are critics of No Child Left Behind (NCLB) and the “Common Core Curriculum” and very much opposed to student testing in elementary grades. That may be why they are so inclined to see “testitis” creeping into the early grades. While there is some evidence of it in American elementary schools, the same cannot be said for Canadian schools. No homework is given in Kindergarten and only modest amounts in Grades 1 to 3. Provincial testing is administered starting in Grade 3 but it cannot be described as “high stakes” testing of the kind found at higher grades in the United States. Lukianoff and Haidt’s The Coddling of the American Mind offers a telling critique of what’s gone wrong on many university colleges. Children from advantaged backgrounds may, from an early age, be subjected to academic pressures and discouraged from engaging in free play. Parents with two degrees and homes full of books give privileged kids an early immersion in learning and, in many cases, have the added benefit of parents providing explicit instruction to fill gaps in understanding. Over-parenting can and does produce coddled children , but it’s a stretch to claim that this is the real life experience of children from less favoured circumstances, raised in disadvantaged and marginalized communities. Early learning programs in Canada, with few exceptions, are “play-based” and place considerable emphasis on nurturing social skills and supporting ‘student well-being.” Few Canadian early learning researchers would recognize the pre-schools and kindergartens as depicted in Lukianoff and Haidt’s otherwise impressive book. In fact, it’s tempting to hypothesize that Canadian primary years programs are actually the nurseries for a younger generation who are so bubble-wrapped that “skinned knees” are treated as calamities. Where’s the evidence that “play-learning” is imperiled in today’s pre-schools and kindergartens? How prevalent is “helicopter parenting” and is it directed toward raising standards or to ‘school-proofing’ kids? Is it fair to suggest that play learning and academic learning are mutually incompatible? Is “safetyism” what is actually being taught in kindergarten? The Private Tutoring Explosion: Why are Parents Turning to Tutors After School? The McTutor World is on the rise. Private tutoring is growing by leaps and bounds and it’s now the fastest growing segment of Canadian K-12 education. Since the financial meltdown of 2008, the tutoring business has rebounded, particularly in major Canadian cities and the burgeoning suburbs. From 2010 to 2013, Kumon Math centre enrollment in Canada rose by 23% and is now averaging 5 % growth a year. It’s estimated that one in three city parents in Toronto, Montreal, Vancouver and Calgary now hire private tutors for their kids. My recent radio interviews on CBC Radio Drive Home shows (September 4-5, 2014) focused on the trend and tackled the bigger question of why today’s parents are turning increasingly to after-school tutors to supplement the regular school program. That’s a question that begs for a more thorough, in-depth explanation. The expansion of private tutoring is driven by a combination of factors. The world is changing and, for good or ill, we now inhabit an increasingly competitive global world. International student testing is one symptom and so are provincial testing programs — and parents are better informed than ever before on where students and schools rank in terms of student achievement. While high school graduation rates are rising, student performance indicators are either flat-lined or declining, especially in Atlantic Canada. In most Canadian provinces, university educated parents also have higher expectations for their children and the entire public education system is geared more to university preparation than to employability skills. System issues play a critical role in convincing parents to turn to tutors. Promoting “Success for All” has come to signify a decline in standards and the entrenchment of “social promotion” reflected in student reports overflowing with edu-babble about “learning outcomes” but saying little about the pupils themselves. When parents see their kids struggling to read and unable to perform simple calculations, reassurances that “everything is fine” raises more red flags. New elementary school curricula in Literacy and Mathematics only compound the problem —and both “Discovery Math” and “Whole Language” reading approaches now face a groundswell of parental dissent, especially in Manitoba, Alberta, British Columbia, and Ontario. It’s no accident that the private tutors provide early reading instruction utilizing systematic phonics and most teach Math using traditional numbers based methods. The tutoring business is definitely market-driven and more sensitive to public demand and expectations. Canadian academic researchers Scott Davies and Janice Aurini have shown the dramatic shift, starting in the mid-1990s, toward the franchising of private tutoring. Up until then, tutoring was mostly a “cottage industry” run in homes and local libraries, mainly serving high schoolers, and focusing on homework completion and test/exam preparation. With the entry of franchises like Sylvan Learning, Oxford Learning, and Kumon, tutoring evolved into private “learning centres” in cities and the affluent suburbs. The new tutoring centres, typically compact 1,200 sq. ft spaces in shopping plazas, offered initial learning level assessments, study skills programs, Math skills instruction, career planning, and even high school and university admissions testing preparation. Hiring private tutors can be costly, but parents today are determined to come to the rescue of their struggling kids or to give the motivated child an extra edge. Today it’s gone far beyond introducing your child to reading with “Fun with Phonics” and some Walmart stores even stock John Mighton’s tutoring books for the JUMP Math program. An initial assessment costs $99 to $125 and can be irresistable after reading those jargon-filled, mark-less reports. For a full tutoring program, two nights a week, the costs can easily reach $2,o00 to $3,000 a school year. Once enrolled, parents are far more likely to look to private independent schools, a more expensive option, but one that can make after-school family life a lot simpler and less hectic. The tutoring explosion is putting real pressure on today’s public schools. Operating from 8:30 am until 3:00 pm, with “bankers’ hours,” regular schools are doing their best to cope with the new demands and competition, in the form of virtual learning and after-hours tutoring programs. Parents are expecting more and, like Netflicks, on demand! That is likely to be at the centre of a much larger public conversation about the future of traditional, bricks and mortar, limited hours schooling. What explains the phenomenal growth of private tutoring? With public schools closing at 3:00 pm, will today’s parents turn increasingly to online, virtual education to plug the holes and address the skills deficit? How will we insure that access to private tutors does not further deepen the educational inequities already present in Canada and the United States? Will the “Shadow Education” system expand to the point that public schools are forced to respond to the competition? Back-to-School Stress: Why Are Kids, Parents, and Teachers So Anxious? Anxiety and the jitters are winning the Back-to-School internal tug-of-war with excitement and exhilaration. Today’s schoolkids are full of worries, feeling threatened by cyberbullying and being diagnosed with new forms of childhood and teen anxiety and depression. “Typical” Parents are hovering in helicopter formations waiting for schools to open, and a few are fretting about, and envious of, Finnish education. Pencil, pen and paper teachers wedded to chalkboards are quietly derided as throwbacks for resisting mobile learning devices and shunning the latest Apps. While all of this is a gross distortion of reality, it does reflect the impressions and perceptions conveyed in Back-to-school media reports, including the recent series of articles featured in Canada’s national newspaper, The Globe and Mail. High anxiety clearly consumed Canadian news columnist Elizabeth Renzetti. In “Back-to School Stress,” The Globe and Mail, 31 August 2013, she grabs our attention with this lead: “The week before school begins is often filled with a special anxiety. Every night is dominated by the hour of the wolf, the sleepless time of dread: What will class be like this year? Pass or fail? How to keep up? When it’s all over will there be any jobs left that don’t require a polyester uniform?” That’s just the pretext for apiece about Amanda Ripley’s new book, The Smartest Kids in the World. Reading it will only generate more worries about why our kids are falling behind those in Finland in the international race to the top. One Back-to School news story produced by CTV News, aired on September 4, 2012, is back and posted on “Back-to-School” section of The Globe and Mail website. The news clip, “Nerves and Excitement on the First Day of School,” is enough to rattle even the most seasoned parent and educator. It focused on the first anxious day for kIndergarten kids at Carlton Village School in Toronto and was followed by a Metro Toronto Police news story warning parents about the child safety dangers of dropping-off their kids at school. Even today’s teachers are feeling the pressure. For educators, trying to keep pace with technology is daunting. After all iPads have only been on the market since April 2010, and now they are the all-in-one device that is insinuating itself into every corner of daily life, including the schools. Social media inspired educators like Thomas Whitby, founder of #edchat, are a constant reminder of how much more teachers could be doing to integrate technology into teaching and professional learning. Shutting the classroom door and carrying on the usual “chalktalk” routine are getting harder when your SMART Phone Twitter feed contains a stream of links to pieces like those aggregated on Edutopia. Few education observers or policy analysts dig a little deeper trying to fathom and explain why going back to school has become such a source of ‘over-the-top’ anxieties for kids, parents, and teachers. Buried in those Back-to-School stories is one that does, a September 2012 interview with Zander Sherman, author of The Curiosity of School. In that interview with Chris Berube, Sherman argues the changes in the nature of The School are the source of the problem. What’s gone wrong? “Education should be about instilling a sense of wonder and a love of learning,” Without the capacity to instill that curiosity, Sherman points out that schools can have a deadening effect on children and teachers. Going to school should be like going to the gym for personal fitness — an experience people actually look forward to. What’s the real cause of Back-to-School stress for students, parents and teachers? To what extent do professional experts and well-intentioned educators contribute to the hype and apprehensions? Do schoolchildren today dread school anymore than their parents — or grandparents? How legitimate is Zander Sherman’s claim that changes in The School itself are heightening the natural anxieties? Childhood and Innocence: Who is Under Siege -and from What? As a committed social progressive, Bakan claims to have been called into action to protect our kids from the faceless, soul-less, rapacious corporation. Since its publication, the book has attracted mostly favourable attention, particularly on CBC Radio and TV, where the Michigan-born UBC law professor is often treated as a popular media personality. In Childhood Under Siege, parents and children are depicted as innocents who represent easy prey for the corporation. From the outset, Bakan comes-off as a rather naive and protective parent who is startled to discover that his 11-year-old son’s “really cool” Internet games site is a gateway to such appalling “kiddie” fare as “Whack Your Soul Mate” and “Boneless Girl.” That horrible revelation, according to the author, is really what prompted him to resume his war against corporate influence in North American life. For today’s kids, Balkan shows that it’s a dangerous world out there. Spending hours and hours online exposes them to cyberworlds and social media which feed teenage narcissism and promote deranged, highly competitive and unhealthy values. Relentlessly targeted by red haired clowns (McDonalds) and hipster icons (Starbucks), they come to pester their parents for fast food, junk snacks, and sugary, high voltage drinks. Sections of the book do deliver a profoundly important message. Bakan is at his best when exposing what is termed “Big Pharma.” Here his overarching thesis hits closer to the mark. In many cases, big pharmaceutical companies have not only smothered negative scientific studies, but also co-opted medical professionals to create a popular culture where drugs solve everything –and where kids actually label themselves “ADHD” before being seen by a doctor. Balkan’s litany of sins perpetuated by big businesses knows few limits. It’s the corporations that pollute the child’s playroom environment with toxins, turn a blind eye to noxious gases, exploit child labour, and promote “market-driven” reforms in public education. In taking a big scope, Bakan covers much territory and his sweeping analysis tends to reflect a clear presentist bias. Paying more attention to the history of childhood would have yielded deeper insights into the cyclical pattern of exaggerated parental worries, including the supposed corrupting influence of such blights as 19th century “dime novels,” The Simpsons, and South Park. Though the book tends to focus on the United States, Balkan tries to demonstrate that Canadian children are also being victimized in similar fashion. He knows the law and effectively documents the holes in child protection laws in Canada as in the U.S. Raising red flags about creeping corporate influence in Canadian public education through privately-managed charter schools, standardized testing, and rampant commercialization simply does not wash.
Thoughtful critics have already begun to dismiss Childhood Under Siege as a sincere, well-intended book which falls short of expectations. 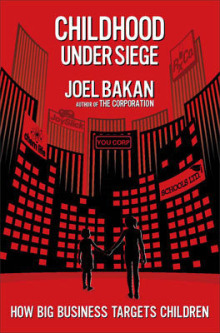 http://www.theglobeandmail.com/news/arts/books/childhood-under-siege-how-big-business-targets-children-by-joel-bakan/article2143228/ While The Corporation was very convincing in exposing the extent of corporate influence, the sequel runs aground in the complex, multi-faceted realm of childhood, parenting, and family life. Parents play a much bigger role than Bakan ever acknowledges and, truth be told, “hyper-parenting” is threatening to produce a generation of “coddled kids.” Today’s kids teenagers are also mighty savvy when it comes to “The Pester Factor,” bugging their harried parents into buying the latest version of every consumer item. The author shows a surprisingly naive faith in the capacity of government to safeguard our children. Looking to government to solve most matters, as Bakan does, will find little resonance with those who are already sceptical of the friendly state. After all, as German sociologist Max Weber once warned us, “parcelling out-of-the soul” is common to all bureaucracies, public as well as private. Why is Bakan’s Childhood Under Siege being hailed as “an important book” for parents and policy-makers? How well founded are the scare stories aimed at exposing the supposed evils of corporate influence in Canadian public education? Who is really under siege — kids, parents, or the family? What’s the primary source of the problem – rampant materialism, big business influences, the decline of family values, or the stressful pace of life? Raising Young Girls: Does “Toddlers & Tiaras” Have Any Significance? But unlike Oprah—who won Miss Black Tennessee at the age of 18—Eden is building an empire without knowing how to write or do math calculations. Her range of merchandise already includes a rather mature-looking Eden showgirl action figure, the “Eden Wood Princess Canopy Bed Collection” and a memoir entitled “From Cradle to Crown” (available for just $15 plus shipping and handling on Eden’s official web site). Critics of Toddlers & Tiaras find the TLC cable program to be “the most disgusting show on television.” http://www.sfgate.com/cgi-bin/blogs/sfmoms/detail?entry_id=43981 It has spawned “Cancel Toddlers & Tiaras” Facebook pages and sparked protests over the past three years, all to no avail. Some 5,000 Australians signed petitions in a failed attempt to bar Eden Wood from entering their country in late July 2011. Child psychologist Collett Smart went head-to-head with Mickie Wood on a current affairs show, Today Tonightt, but the six-year-old’s mother was undeterred. The TV show continues to air despite the concerted efforts of parent groups to raise public awareness about the sexualization of girls. According to some reports, over 100,00 American children partiipate in these girls beauty pageants each year. Yet concerned parents are beginning to understand the emotional, psychological, and physical harm a young girl is exposed to when she is sexualized. As the 2007 American Psychological Association’s task force report showed us, early sexualization can lead to self-esteem issues, depression, eating disorders, and early promiscuity. The TLC cable TV show “Toddlers & Tiaras” has stirred up quite a controversy and that raging debate begs a few critical questions. Should we be taking shows like “Toddlers & Tiaras” seriously? Who in their right mind would be influenced by such trashy television, except the foolish and impressionable? Will the show set back the cause of advancing womanhood or encourage more hyperparenting? And why do networks like TLC keep renewing such shows? Families Under Pressure: What’s the Impact on Parents and Kids? We live in a high pressure world. Our work day now extends beyond normal hours, thanks to longer hours at the bank, the grocery store, and the fitness centre. The Blackberry has invaded every aspect of our daily lives, blurring the lines between business and pleasure. Growing numbers of Canadians admit to working virtually around the clock. We’re more stressed, less rested and have less time to devote to our kids. Welcome to life in the early 21st century. This is not just another rant, but rather a quick synthesis of the results of the Canadian Index of Wellbeing Report, released June 15, 2010, and aptly entitled Caught in the Time Crunch: Time Use, Leisure and Culture in Canada. It’s also a report that captured headlines across Canada — and left many Canadians nodding in agreement that the time has come to assess the total impact on our families as well as our general wellbeing. Shrinking Leisure Time: More time working means less time for social activities; only 5 % find time for arts and culture activities, fewer than ever visit national parks. The Time Crunch means that work-life is taking over our lives, cutting deeply into time spent with family, refreshing our minds, and exercising our bodies. We are clearly being driven by the pace set by our globalized, technologically advanced world. The CBC-TV Doc Zone program, Hyper Parents & Coddled Kids (2010), drove the message home: What began as sheltering children from a dangerous world and preventing those “skinned knees” was producing a generation of “coddled kids” unable or unwilling to function on their own. The spectre of “hyper-parenting” crept up on us slowly. We just wanted what was best for our kids and now nothing is too good for them. What’s causing families to be so under pressure? What’s the impact on well-meaning parents ? Are today’s parents giving children a leg-up in life? Or are we creating problems that will last a lifetime? Let’s hear from you.